A tooth implant is a “root” device, usually made of titanium, used in dentistry to support restorations that replace a tooth or group of teeth. Dental implants can be used to support a number of dental prostheses, including dental crowns, implant-supported dentures or bridges. They can also be used as anchorage for orthodontic tooth movement. The use of dental implants permits unidirectional tooth movement without reciprocal action. 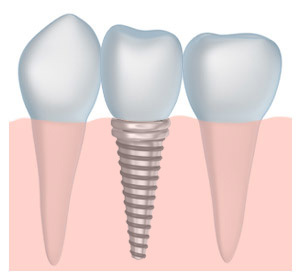 A typical tooth implant consists of a titanium screw (resembling a tooth root) with a roughened or smooth surface with the majority of dental implants being made of pure titanium. When a tooth implant is placed, the bone and the tooth implant will heal together, eventually fusing in a process called osseointegration. This stabilizes the post, making it just as secure and permanent as the original tooth root. The amount of time required to place a dental implant will vary on several factors including the quality and quantity of the bone and the ease of each individual situation. Dental implant dentist Dr. Shane Sykes has wide experience with the most modern procedures used for dental implants. He is skilled in implant dentistry, having completed a large number of successful dental implant procedures. The Reno Dentist’s modern facilities, the state-of-the-art equipment used to ensure a comfortable dental implant procedure and the confidence our staff instills in our patients is top of the field in implant dentistry. Our patients are like members of the family, and we treat each one with that extra care that separates the outstanding dental practices from the norm. The placement of a tooth implant requires tremendously skilled hands and a thorough understanding of advanced dental treatment techniques. The placement of dental implants is not taken lightly at The Reno Dentist and requires advanced certification courses. You will be comfortable and confident as you watch Dr. Sykes emphasize treatment planning, dental implant placement protocol and restorative techniques. Schedule a visit with us to find out if dental implants are the solution you’ve been looking for. Contact our office in the Reno – Spanish Springs – Sparks NV metro area today. Simply give us a call at the number above or fill out the form to the right. With implant dentistry, your smile can be full, healthy and beautiful again.